Dump recipes are fantastic. They save you time, money, and can be outright delicious! This Slow Cooker Pot Roast is a perfect example of this. It's seriously the best pot roast I've ever had… the Texas BBQ kick just takes it over the top! Savory, a little spicy, and a little sweet, you will LOVE this. Is there a meal more boring and bland than crockpot pot roast? At least, that's how our parents might have made it. Well this piece of beef is anything but bland. 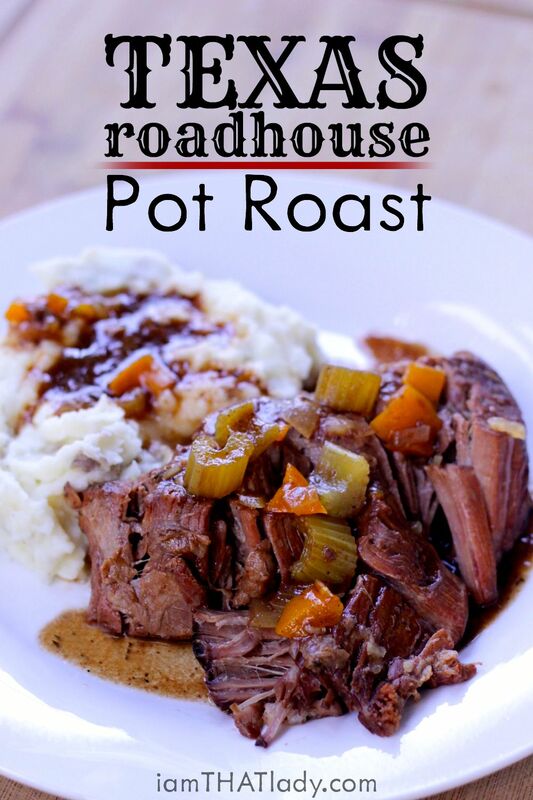 This Texas Roadhouse Pot Roast is PACKED with flavor. There will NOT be leftovers with this one. 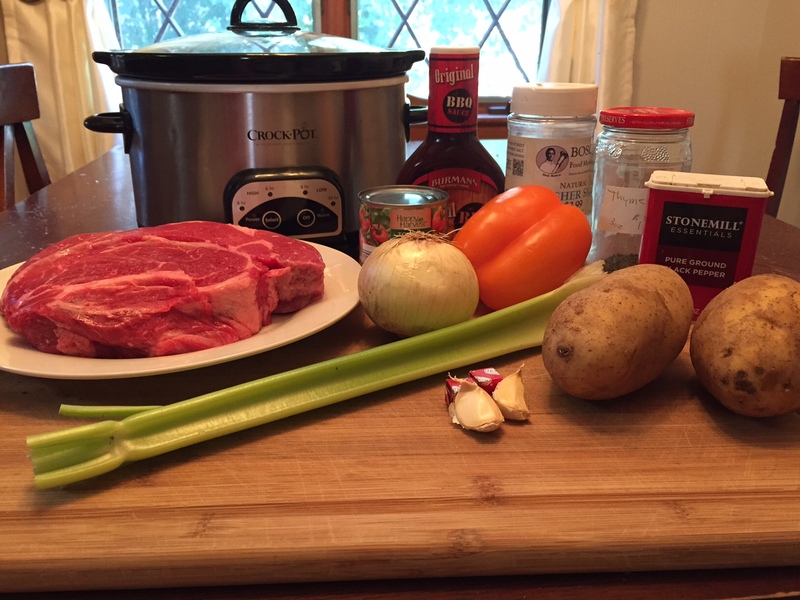 It starts with a chuck roast… the classic pot roast cut. There's no reason to mess with that – the chuck roast is one of the most flavorful and rich cuts of beef. As for the instructions – basically the only work is to chop the vegetables. After that, you just kinda throw it all in the crockpot and turn it on. I usually place the meat first, then vegetables, spices and finally the liquid ingredients. The BBQ sauce is actually a mix of your standard cheap BBQ sauce and tomato sauce. It works really well in this. About 8 hours later on low, and it looks and smells wonderful. Oh my goodness there is SOO much flavor in this. for the potatoes, you can chop them up and put them in with all of the vegetables. Or if you prefer, use them to make mashed potatoes. The juices from the crockpot are amazing poured over mashed potatoes. Pot Roast doesn't have to be boring! This Texas Roadhouse Pot Roast is PACKED with flavor. You will LOVE this! Place roast in the bottom of the slow cooker. 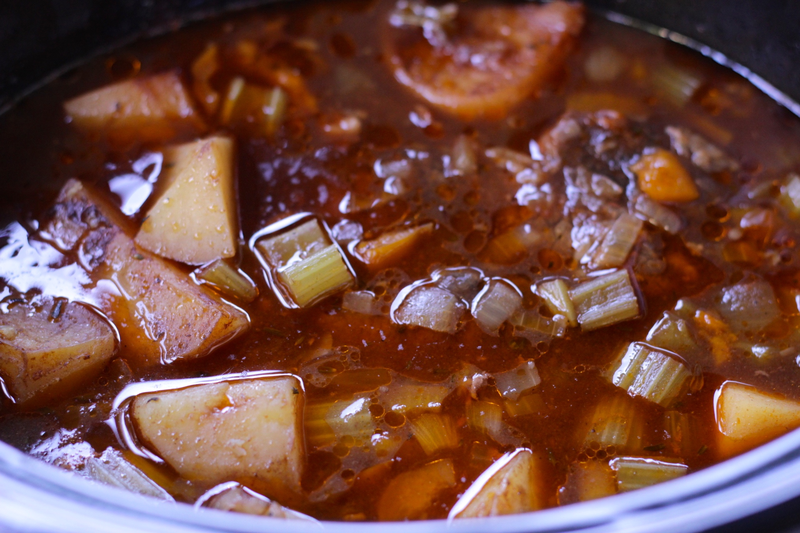 Top with vegetables and potatoes (optional). Top with BBQ sauce, tomato sauce, water and spices. 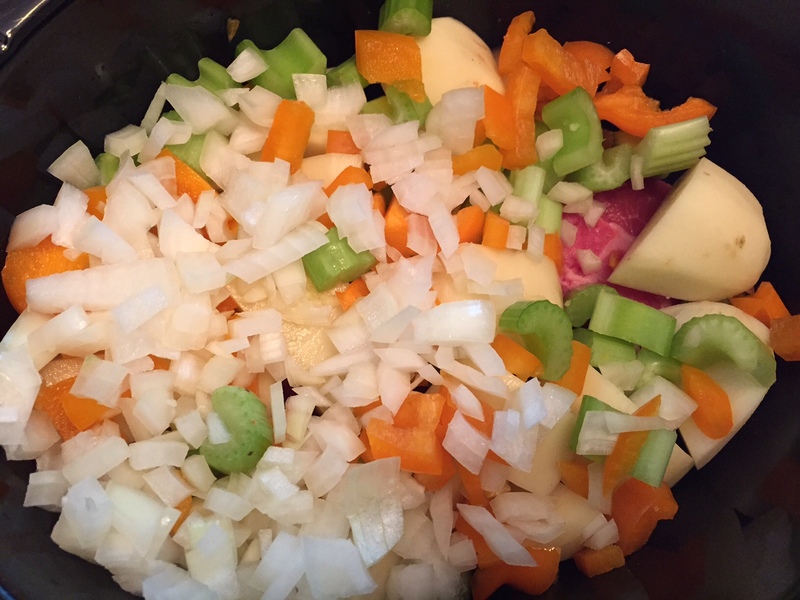 Once hot, add onion, bell pepper, celery, salt, black pepper, and thyme. Add garlic and saute for one more minute. Add all other ingredients to the Instant Pot and close lid. Pressure cook for 70 minutes. Let the Instant Pot depressurize for 10 minutes, then release the rest of the pressure. Thank you so much.My family loved it. It was so good! It surprised me! I made this for a family get together it is fantastic!! This was delicious and super easy! Will definitely make again. Made this today and everyone loved it! Definitely making pot roast this way from now on! Could I cook this on high for 4 hours? You may risk drying it out if you cook it fast like that. I would recommend sticking with the time in the post. I did it on high for about 4 hours and it came out wonderfully! However, I do have an older crockpot – about 15 years old. What would you recommend cooking time and temp in the oven? Silly question, how would I prep this for the freezer? I am trying to stock my father-in-law’s freezer with dump meals. Thank you. Do you brown the meat first before adding it to the slow cooker? I made this in my crock pot today & it was sooooo good. Thank you for sharing this fabulous recipe! Marvin, that won’t work. 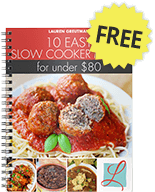 I would suggest purchasing a slow cooker for these recipes. Can the recipe be doubled? 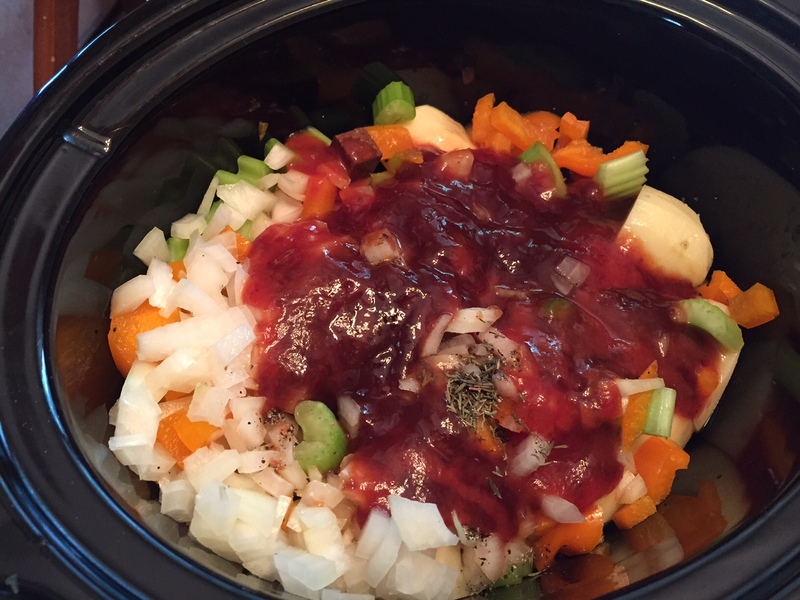 I’m not a big slow cooker fan – most recipes I’ve tried have been underwhelming – until this one! I can’t believe how well it turned out. I did brown the meat first, and I also left the potatoes out and mashed them instead – great suggestion! The gravy was soooo good over the potatoes. I’m not a huge fan of store bought BBQ sauce but I have to say it worked really well in this and the gravy did not have an overly smoky flavor. 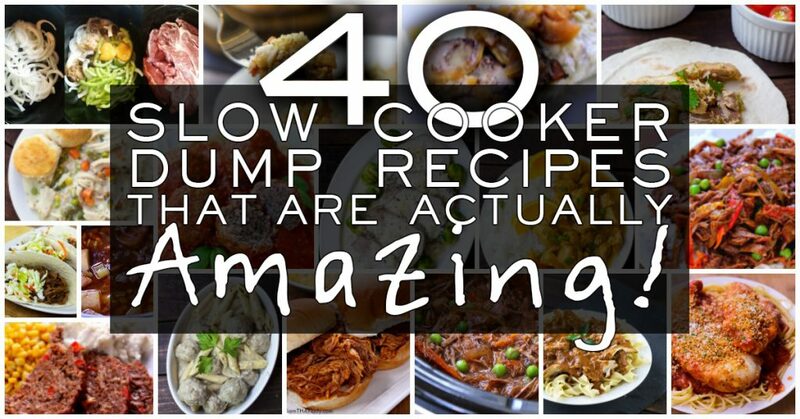 I’m going to try the “dump” version (without browning) the next time, when we make it on a weekday. Big thumbs up on this one! What do you think about adding carrots? Have you experienced problems with excess fat in the roasts? I spent a lot of time after mine was done removing fat. This was not really to my taste or my family’s. The BBQ flavor especially didn’t compliment the roast very well. It wasn’t terrible and it definitely had flavor, just not a flavor we liked. Too bad because it was easy to make. The roast I usually make is more complicated and time consuming. I totally agree with you. The meat was nice and tender, but the flavour was just a bit weird. I think I’m just more of a “red wine, rosemary and bay leaf stew” kind of person. My husband says it was d**** delicious! Best roast we ever had! Thank you! Do you need to do anything different if adding carrots? Can I half this receipe for two? This is a recipe my husband and I conjured up some 30 years ago, adding some of this, some of that, wait, a little more of this, now it needs more that, noting every addition, until we were happy with the flavor. By the time we were done, we had filled a large mixing bowl! Fortunately, it keeps a long time in the fridge, thanks to the vinegar. Family and friends love it, and always request we bring it to cookouts. It’s a little tangy, a little sweet and a little spicy. You’ll want to omit the liquid smoke. Combine all ingredients in a small saucepan and bring to a simmer. Reduce heat to low and let it cook, covered, for 15 minutes, stirring occasionally. Makes about 1.5 cups. Did you use the 1/2 cup of tomato sauce with this or did you omit it? Also, for this pot roast recipe, did you use 1/2 c of you own sauce you mentioned above? Thank you! I am wanting to try this tonight with your sauce recipe! I just made this Texas Roadhouse Pot Roast for the first time and it is smelling so good can’t wait to have dinner. Thank you for the receipe. I am making the instant pot version of this now. The directions just say pressure cook for 70 minutes. I assume you would do this on the meat/stew setting of the instant pot. Is this correct or do you use manuel setting?